I Almost Met the President on My Trip to Washington D.C. When Spring rolls around, so does vacation season. Kids normally have spring break during this time, so it’s a perfect opportunity to take a break from everything and visit a destination city. One of the most popular cities to travel to, whether it be with the family or with a group, is Washington D.C. I’m sure when you think of our nation’s capital, at least 10 different things pop into your head as far as what you could do there. To simplify your options, here is a list of places you could check out while in Washington D.C.
Go to a Museum – You’re in a city filled with so much history, there’s no way you can leave before checking out one of the 19 museums located here. Whether your interest is space, natural history, or art, there’s going to be a museum for you. If you brought the kids, it would be a good plan to dedicate one day to “museum hopping.” The cool thing about the museums is that most of them are opened 7 days a week and a lot of them are free to visit. Click here to review a list of museums that you can visit. Visit the National Monuments/Memorials –It wouldn’t make sense to visit D.C. without checking out some of the historical monuments found here. The Washington Monument and the Lincoln Memorial are two of the best to see. One of the good things about them is that most of them are open all day and night, so you don’t have to go during a scheduled time. They look just as beautiful at night as they do during the day. The White House – The White House is one of the hottest attractions in the entire country, so it’s only fitting that you make time to see this hot spot. If you want to actually tour it, you’ll have to book in advance. 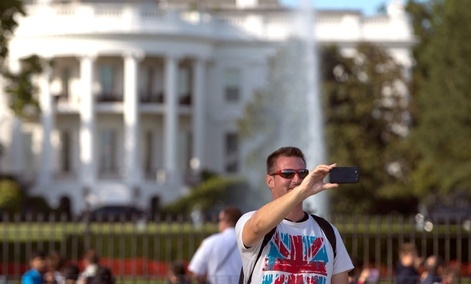 If you’re in the city, it’s not hard to just walk up to 1600 Pennsylvania Ave and take a selfie of yourself outside the building.